← It’s Time to ‘Green Up’ your Lake Norman Landscaping! What role does insulation play in a “Green” home? We all know that energy efficiency is a big component of a “green” home. Properly sealed, moisture protected, and insulated walls help increase comfort, reduce noise and save energy. Most people know that the different levels of insulation are measured in R-Values. 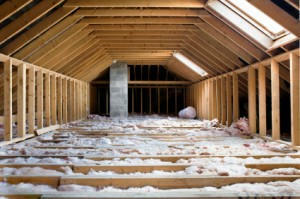 But, there are also many types of insulation which provide different qualities of performance. Insulation level is specified by R-value. R-value is a measure of the insulation’s ability to resist heat traveling through it. The higher the R-value, the better the thermal performance of the insulation. Generally recommended R-values = R-38 for ceilings, R-21 for walls and R-10+ for foundations. Rigid foam insulation – higher R-value per inch than fiberglass or cellulose insulation. Stops air leaks. More expensive. Foam-in-place insulation – blown into walls, reduces air leakage. It is preferable to use Carbon Dioxide in the manufacturing process than more environmentally harmful gases such as pentane or hyrofluorocarbons. Nu-Wool Premium Cellulose Insulation…Green Since 1949: Made from recycled newspaper, this product is blown in for maximum reduction of air leakage and claims to save a homeowner up to 40% on utility bills. Nu-wool is an Energy Star product and adds significant points toward a LEED Certification. www.nuwool.com. Sealection Agribalance Spray Foam Insulation: Is another highly energy efficient spray foam insulation with approval by “Energy Choice”, a member of the US Green Building Council and an Energy Star partner. They offer several products including Heatlok Soy spray polyurethane foam. BioBased Insulation is an energy efficient, soy-based spray foam insulation that is said to be ” the most environmentally friendly insulation” because of it’s use of soy-based technology and a minimum of petroleum. NCFI polyurethanes Spray Polyurethane Foam Insulation claims to be “simply the best insulation you can install”. Low -E Reflective Insulation: “Reduces your carbon footprint”. BioFoam Insulation (919.821.3288): ” A healthier, more durable, energy efficient and environmentally responsible insulation.” It is applied as a liquid which quickly expands, conforming and filling cavities,and voids to create a sealed thermal envelope. Named “Outstanding Green Product of the Year” in 2003 by the National Association of Home Builders. Clearly there are many insulation products available with varying degrees of energy efficiency and additional benefits in comfort, sound proofing and even health. If you are interested in learning more about how to make your home more energy efficient, I highly recommend that you work with a Certified Green Builder. You can contact the Lake Norman Home Builder’s Association for a list of CGB’s in our area. This entry was posted in Building a Green Home, How to Budget for the Construction, How to Improve Health and Comfort and tagged How to Improve Energy Efficiency, Insulation, Lake Norman Green Homes. Bookmark the permalink.